Sophia uses watercolour to capture atmosphere through light, colour, and pattern. She completed her degree at Brighton and her MA at Wimbledon both in fine art printmaking. She worked in etching, but mainly in lithography. 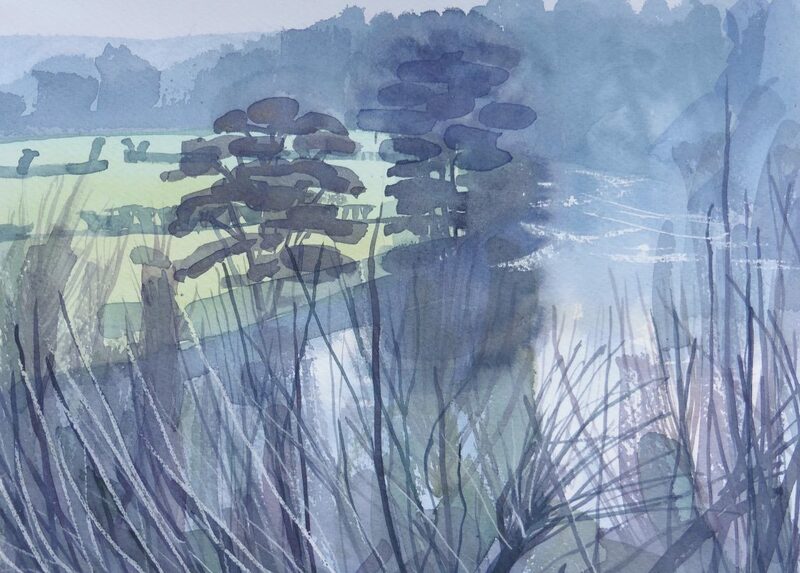 She lives in Oxfordshire, and now uses watercolour: painting landscapes, looking for particular conditions of light that can give a sense of fleeting luminous magic. This happens for brief glimpses when the shifting light conditions are aligned with the colours and shapes of the landscape in a way that makes you hold your breath at the momentary beauty of the scene. As well as magic, she seeks to convey a sense of contemplative space, of places where one can be alone and yet feel a primal sense of connection and of belonging. Her paintings contain a meditative calm, a pictorial essence of the restorative peace and the safe-ness that can be found within landscape. Her influences include Winifred Nicholson for her immediacy and her depiction of light; Ivon Hitchens for his sense of place, his colour and the brevity of his marks; Odilon Redon for his charm and magic; Piero Della Francesca for his stillness; Paul Nash’s later paintings for their colour and sense of mystery and magic. Sophia….I think your paintings are beautiful…Any more of Stevie????? My pal…. Have just had a smooch around your lovely online gallery. Your paintings are absolutely gorgeous. I would love to have a look at the real deal next time I visit. Your influences have served you well. You have charm, a sense of magic and peaceful rawness a fluency with colour. Snapshots that make me want to be there with the wind in my hair too. Well done Soph!